New Baxi Boilers available from Atlas Plumbing Merchants Manchester. Atlas Heating Supplies are your local Plumbing Merchants and with branches in Manchester, Warrington and Huddersfield we are within easy reach of the whole North West when you are looking for a new Baxi Boiler, top quality branded boilers and all your other plumbing requirements. 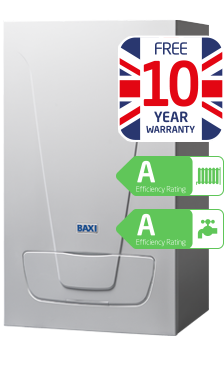 Are you looking for a new replacement Baxi Boiler ? Atlas Heating Supplies have been supplying branded boilers including Baxi Boilers to both the public and trade customers for many years and have the knowledge and experience to help you chose the correct one for you. Baxi is proud to have been manufacturing in the UK since 1866. Baxi’s ethos of pride, passion and positivity – combined with reliability, respect and innovation – has helped define our company. From our customer support to our industry-leading hands-on training for installers, we are committed to making life with Baxi as easy as possible.